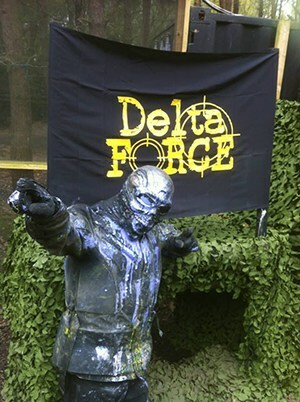 Delta Force Paintball Glasgow: The Ultimate Paintball Experience! If you’re looking for paintballing in Glasgow, Delta Force has you covered. We have one paintball centre in West Glasgow and another in East Glasgow – opening Feb 2015. So for the moment Paintball West Glasgow is the perfect choice for paintball fans living in Scotland! Offering customers 7 thrilling game zones to explore and first-class facilities at basecamp, our West Glasgow Paintball centre is a firm favourite, and even been awarded 4 stars by the Scottish Tourist Board. Located just off junction 29 on the M8 motorway, the paintball centre is easy to get to from Glasgow, Paisley, Greenock and the surrounding areas, making it a popular choice for Scottish paintball customers. 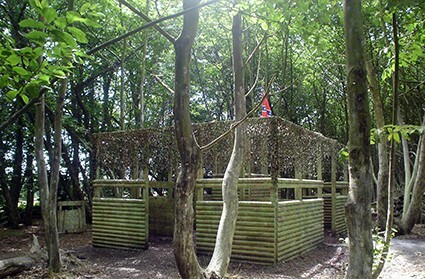 The game zones at the West Glasgow Paintball Centre include: ‘Afghan Fort’ which includes a huge two-storey wooden fortress, hidden underneath lots of camouflage netting, ‘Chemical Alley’ which involves either attack or defend tactics in an aggressive game of speedball, ‘London Bus’ which features original double decker buses, ‘Mad Murphy’s Jungle Attack’ which is set deep withinthe rainforest, ‘The Haunted Graveyard’ which is home to an old church and lots of creepy-looking coffins and gravestones, ‘Tomb Raider’ which features a giant stone pyramid with tunnels and statues, and ‘Viet Cong Village which is home to lots of wooden village huts and a disused chapel. The centre also boasts first-rate facilities at basecamp, from open and covered picnic areas with lots of seating, proper flushing toilets on mains water and secure lockers for customers to store their belongings (at a small charge). And, if you’re celebrating your birthday with Delta Force Paintball West Glasgow, we can even arrange for birthday cake (BYO) to be served – making your day with us feel really special. And your day wouldn’t be complete, without coming face-to-face with theDelta Force Terminator! Armed with his deadly BT4 combat paintball markers, the Terminator lurks in the woods, looking for a worthy foe! If he decides he wants to fight you, he’ll raise his guns and point them at you. If you’re feeling brave enough to accept his challenge, all you need to do is point your gun back at him and open fire – taking him on one-to-one!! If he deems you a worthy opponent, he’ll surrender one of his lethal weapons for you to use for the remainder of the game! If you’d like to book your paintball event at Delta Force Paintball West Glasgow, or to simply find out more, call the bookings team on 0203 869 9301 today!